I glanced down at my camera and noticed that there were only nine frames left. I had been photographing a backlit roadrunner from my vehicle on the tour road at Bosque Del Apache National Wildlife Refuge near San Antonio, New Mexico. I knew that I had to leave in the next few minutes, as I had a plane to catch. I mounted a 2X teleconverter behind my Canon 600mm f/4.0 L Image Stabilizer lens to expose the last few frames of slide film. With the 1200mm(effective focal length) lens resting only on the car window and a shutter speed of 1/45th of a second, I knew that the resulting images would be unsharp even with Image Stabilizer technology. A week later, when I viewed the images on the light box, I was stunned: 6 of the nine frames were exceedingly sharp! The eye was rendered in sharp focus. I could clearly see the reflection of my rental car in the bird's eye. And, … the tires! Before the first Canon Image Stabilizer (IS) super-telephoto lenses were introduced, many folks asked if I would be trading in my old Canon EF 600mm f/L lens. Knowing that the new IS version would be almost two pounds lighter and focus two feet closer, I responded by saying that, as a full time professional photographer specializing in birds, I would switch even if IS proved to be of no benefit at all; the reduced weight and closer focusing of the new 600 IS would make it a worthwhile investment for me. From the get-go, however, the super-telephoto Image Stabilizer technology, which is designed to work with tripod-mounted lenses, has performed far beyond my or anyone's expectations. I purchased this lens immediately after its release in February 1997 and have enjoyed it now for several years. I have used it successfully to photograph gulls in flight and to make intentionally blurred images of birds in motion. Choosing the IS 2 mode for intentional blurs while using shutter speeds in the 1/8 to 1/30 sec. range ensures that the subject will be rendered recognizably. At Busch Gardens, Florida, I used the 300 IS with the 1.4X teleconverter (TC) to make sharp head shots of a White Ibis at 1/90 of a sec. In addition, its incredibly close focus makes it a more than adequate macro lens for flowers, frogs, and large insects like butterflies and dragonflies. Next in line was the 28-135mm f/3.5-5.6 IS zoom lens which was introduced in February 1998. I keep this short zoom wrapped in a woolen watch cap in the large rear pocket of my X-tra Hand vest and use it for scenics and grab shots. I have made sharp handheld images with this lens while photographing lighted signs in the dark of night at shutter speeds as slow as 1/6 sec. Others report success handholding at ½ sec! 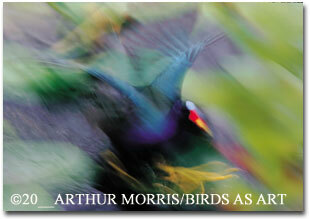 It is a great lens for creating birdscapes: scenic images featuring flocks of birds. Be sure to have this lens on your lap if you have a window seat on a jet airliner, or better yet, when doing aerial photography from a light plane or a helicopter. When the EF 100-400mm f/4.5-5.6 L IS zoom was released in September 1998, I dismissed it at first knowing that my beloved "toy lens," the 400mm f/5.6 L lens was (and still is) the world's finest for handheld flight photography. But once I began using the 100-400 IS zoom I was amazed by its incredible versatility. Today, unless I am in a flight-shooting-only situation, it is the 100-400 IS zoom lens that hangs on a shoulder strap as my auxiliary lens. This push-pull zoom lens features a loosen/tighten tension setting, so that you can either lock (tighten) the lens at the 400mm setting, for example, or adjust it for the smoothest zooming (loosen). In any case, it is usually fairly easy to zoom in and out over the lens's entire focal length range, but at times, I wish that zooming were a bit smoother. The 100-400 can be used for birdscapes and for making images of small groups or flocks of birds without having to cut off individual birds on the frame-edge. At Lake-Walk-In-Water, three minutes from my home office in Indian Lake Estates, Florida, I use the this lens almost every morning in spring to photograph family groups of Sandhill Cranes. At Bosque Del Apache National Wildlife Refuge in New Mexico, I handhold this lightweight, versatile lens to photograph groups of Snow Geese and Sandhill Cranes in flight. It is a perfect lens for photographing the blast-offs, when several thousand geese-flushed by hunting coyotes-create blizzards of white in the crisp, clear New Mexico air. Here again, IS 2 mode allows me to utilize slow shutter speeds to create pleasingly blurred images. Overexposing these intentional blurs can create painterly images that feature pastel colors. The 100-400 is adequate for photographing single birds in flight as well. Like the 300/4L IS, the 100-400 is good lens for larger macro photography subjects. With the addition of a 77mm two element diopter (close-up lens) like the Canon 500D, both the 300 IS and the 100-400 IS can be used for smaller macro subjects as well. With a diopter, the zoom lens outperforms the straight 300mm; by zooming in an out you can vary your magnification. On St. Paul Island in Alaska's Pribilofs, I used the 500 D on the 100-400mm to photograph a variety of small wildflowers that grow nowhere else in the world. And it was a great lens to have in my hands while leaning over a cliff edge to make images of nesting seabirds at point blank range. Without moving an inch, I was able to make a tight vertical of a tiny Parakeet Auklet at 400mm, and then, by zooming out to 200 mm, I was able to produce a totally different image that featured the bird in its habitat, yellow lichens and all. I am often asked how effective the IS feature is when handholding the intermediate telephotos. The answer, "It depends on the photographer." Good photographers using perfect sharpness-techniques will be able to utilize far slower shutter speeds than sloppy shooters. Secondly, with good technique, folks will gain about two stops in usable shutter speed. For birdscapes, I will not hesitate to mount either my 300 or 100-400 IS lenses on a tripod. Here again, the 100-400 provides great flexibility in framing and is a favorite at Bosque for capturing those fantastic sunrises and sunsets that sometimes reduce me to tears with their intensity. Now on to the big guns: in March 1999 Canon introduced four Image Stablizer super-telephoto lenses. Amazingly, these lenses routinely produce razor sharp images when used with the matched EF teleconverters. Images made with the IS super-telephoto lenses and the "old" 2X TCs were so sharp as to be not believable. And Canon has just introduced a series of new TCs, the EF 1.4X II and the EF 2X II. Both feature anti-reflective element coatings and improved weather-resistant sealing. It is reported that the optics in the 2X have been drastically improved. I can't wait to get my hands on them! Though I have never used the EF 300 mm f/2.8 L IS lens, it is reportedly superb. I have never been a big fan of either the 300 f/2.8s or the 400 f/2.8s as bird lenses, but they are superb for those who are nature photography and wildlife generalists, especially for those who like to photograph large mammals in low light. Joe and Mary Ann McDonald, who recently switched to Canon, visit Africa often. Joe opted for the 400 f/2.8 as his big lens, while multiple BG/BBC Wildlife Photographer of the Year award winner Mary Ann (sorry Joe) chose the far lighter 300 f/2.8. Both just love the IS feature for making sharp images while photographing from safari vehicles with bean bag supported lenses. Mary Ann's latest masterpiece, a tight close-up of a male lion biting the face of a water buffalo, was made with the 300/2X TC combination. It looks to me like a surefire BG/BBC winner in the Animal Behaviour category. The 500mm f/4.0 L IS lens is the world's premier super telephoto lens for those photographers smart enough not to lug the 600 mm IS lens around in the field all day. Imagine a fairly light super telephoto lens that focuses down to 14.8 feet and, with the addition of the 2X TC, performs superbly as a 1000mm f/8 lens. Both the EOS 3 and the EOS 1v will provide accurate, responsive autofocus down to f/8, (as long as there is sufficient light and contrast). I recently added the 500 IS to my arsenal and find myself using it more and more. I love to crawl on my belly while photographing shorebirds. This lens's comparatively light weight makes it easy to maneuver about with on the ground. And working routinely at 1000mm means that I do not have to approach as closely as I did with the old 600mm/1.4X combo (840mm). When this article appears, I will be photographing tiny warblers at Crane Creek State Park in Ohio on the Lake Erie shore. I will be leaving the 600mm home as there is lots of walking to do at Crane Creek and the 600 gets brutally heavy when there is hiking to do. I will be using the 2X teleconverter virtually full time along with fill flash, a Better Beamer, and the new Wimberley Flash bracket. The combination of light weight, close focus, and the 1000mm effective focal length make the 500 IS a superb lens for photographing migrant songbirds as they rest, feed, and preen en route to the breeding grounds. On the other hand, the Canon EF 600mm L IS lens is the world's premier bird photography lens. While the 500mm IS lens gives you 1000mm capabilities, the 600mm's 1200mm effective focal length is unbeatable if birds are your passion. Image size increases with the square of the focal length, so the image size of a bird made at the 1200mm focal length at a given distance will be 44% larger than the image size of a bird photographed with the 1000mm focal length at the same distance. The 600 mm IS lens is my everyday workhorse lens. I use it alone, with the 1.4 X TC, with the 2X TC, and at times, with stacked multipliers. With this big lens mounted on a Gitzo 1548 Carbon Fiber tripod and the Wimberley head locked down, I have made many critically sharp images of stationary birds with the 2X TC mounted on the lens and the 1.4X TC behind it. (With the old TCs it was necessary to place a 12mm extension tube between the TCs so that they would mate. This will not be necessary with the II series TCs.) When using stacked multipliers with f/4 lenses, you will need to focus manually. 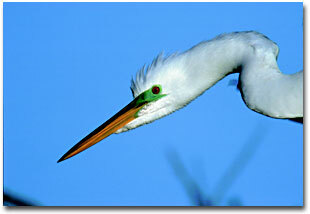 The Great Egret image shown here is a tribute both to the optical quality of Canon's EF lens and the effectiveness of Image Stabilizer technology. Because the TCs are so vital to my work, I own and travel with two of each. On a still morning at the Venice Rookery in Florida, I noticed a gorgeous Great Egret with bright lime green lores sitting atop the colony. I mounted two 2X TCs separated, as described above, by a 12 mm extension tube. Using maximum sharpness techniques, I made a series of images of the bird as it scratched its chin. My shutter speed was 1/125 sec. My effective focal length? Somewhere in the vicinity of 2412 mm. The sharpness of several of the images was simply unbelievable. The bird's ruby red eye looks as if a laser beam etched it. While it is absolutely true that good photographers make good images with whatever lens they have in their hands, the fact is that IS technology allows competent photographers to make sharp images at slower shutter speeds and with longer effective focal length lenses than ever before possible. And this is true whether handholding one of the intermediate lenses or working with one of the four tripod-mounted super-telephotos. Canon's revolutionary Image Stabilizer technology has changed the face of nature and wildlife photography forever. 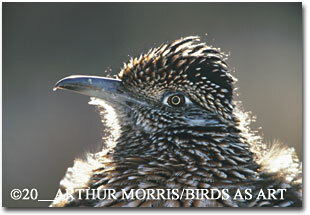 The backlit roadrunner at Bosque was only the beginning. The author would like to thank Ellen Anon and Juli Wilcox for their careful reviews of this manuscript. Editor's Note - Arthur Morris has been a Canon contract photographer since 1995 and continues in that role today. You can learn more about him and BIRDS AS ART by visiting his most informative web site at www.birdsasart.com. 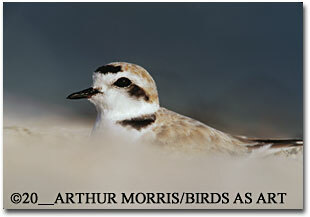 You can receive BIRDS AS ART On-Line Bulletins (free) by e-mailing birdsasart@att.net and requesting same. Photographed from the car at Bosque Del Apache National Wildlife Refuge, San Antonio, New Mexico. Florida. Canon 600mm f/4.0 L IS lens with Canon EF 2X tele-converter and Canon EOS 1v camera body. (IS Mode 1). Lens resting only on car window frame. Hama Double Bubble. Fuji Velvia pushed one stop. Evaluative metering +1/3 stop: 1/45th second at f/8. Photographed at Anhinga Trail, Everglades National Park, Florida. Canon 300mm f/4 L IS lens and Canon EOS A2 body (handheld). (IS Mode 2). Fuji Velvia pushed one stop. Evaluative metering: 1/15 second at f/11. 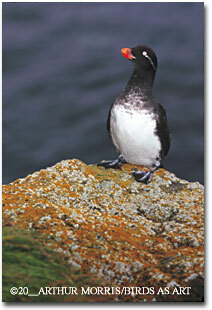 Photographed at St. Paul Island, Pribilofs, Alaska. Handheld Canon 100-400mm L IS zoom lens at 200mm (first image) and at 400mm (second image) with Canon EOS A2 camera body. (IS Mode 1). Pop-up flash at zero (as fill). Fuji Provia F 100 (rated at EI 320) pushed two stops. Evaluative metering +1/2 stop: 1/200 second at f/9.5. Photographed at Sanibel Island, Florida. Canon 500mm f/4.0 L IS lens with Canon EF 2X tele-converter and Canon EOS 1v camera body. (IS Mode 1). Walt Anderson Ground Level Pod and Hama Double Bubble. Fuji Velvia pushed one stop. Evaluative metering: 1/250th second at f/11. Photographed Venice Rookery, South Venice, Florida. Canon 600mm f/4.0 L IS lens with two Canon EF 2X tele-converters stacked around an EF 12mm Extension Tube and Canon EOS 1v camera body. (IS Mode 1). Wimberley Head and Gitzo 1548 Carbon Fiber Tripod. Hama Double Bubble. Fuji Velvia pushed one stop. Evaluative metering +1/3 stop: 1/100th second at f/8 (effective f/11). 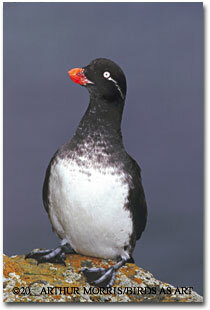 All content copyright 2000 - 2001, Nature Photographers Online Magazine, Inc. All rights reserved.